Okay, I'm aware it looks like I do a lot of shopping. Truth is I'm just really bad at scheduling posts. I picked up a few things a couple of weeks ago when I was #feelingspendy (to quote Amelia). A couple of haircare items were purchased which is unusual for me as I wouldn't call myself much of a haircare fanatic, but there were a few things on my wishlist catching my eye. Denman Dressing Out Brush: I picked this up after seeing Alix's video on how she styles her hair. I'm a huge fan of how gorgeous hers always looks, so I thought I'd give teasing a bit of a go. Obviously, I was not as successful as her, but I'm getting the hang of it. VO5 Give Me Texture Instant Oomph Powder: Now, this is helping with the teasing process even though it is an incredibly weird product. When I paid the checkout woman even asked what on earth this was because the container is so tiny and weighs next to nothing. I expected it to be similar to a dry shampoo but when you apply it to the hair and give it a ruffle, the texture changes into a gritty texturising...thing. It's a bit of an odd one and, again, I think I'll need to give it a few goes before I get the hang of it. Trevor Sorbie Volume Thickening Spray: I'm yet to give this a go, but anything that promises to thicken my hair is dropping straight into my shopping basket. Plus there was a 3-for-2 deal in Boots on haircare so I couldn't pass another item up really. Onto the fun part - make up! 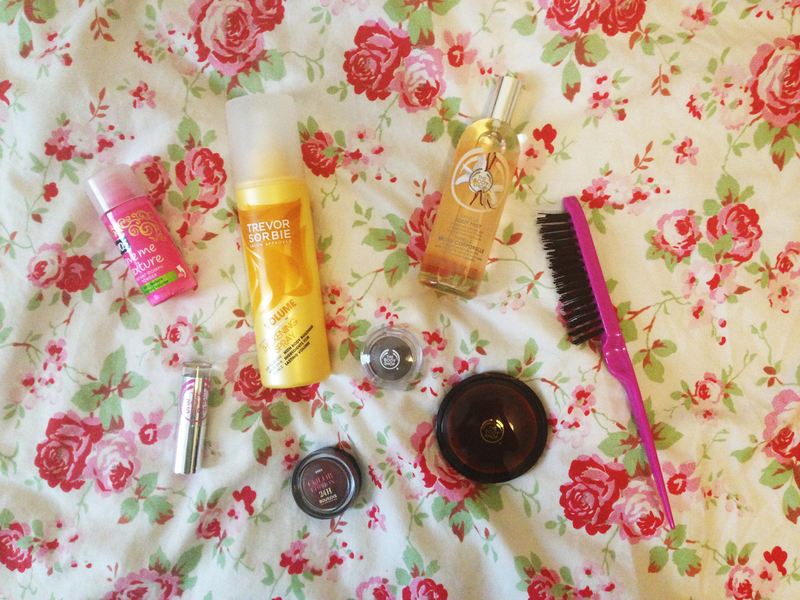 As you can see I went for some offerings from The Body Shop, my first delve into their beauty range. I'm pretty pleased with what I've found. Colour Crush Lipstick in Shade 14: I can't find this exact shade on the website but they had plenty when I was in store, so I wouldn't worry about it going out of stock. This is an incredibly glossy pretty pink colour, perfect for the summer. It's very bright, but good for everyday wear as it's fairly sheer. The formula is pretty good for a highstreet lipstick and it smells of roses, which is always a bonus! Colour Crush Eyeshadow in Brownie & Clyde: First of all, totally adorable name. Second of all, this was another 'curse' of the devious 3-for-2 that people threw at me that day. I've been wanting a dark brown eyeshadow for a while as the deepest brown shade in my Naked Basics palette wasn't dark enough for the smokey eye I wanted to create. This is really pigmented with quite a bit of shimmer in it, but easy to blend out if you apply too much. Honey Bronze Bronzing Powder in Light Matte: I've heard a lot about this, mainly from Estée, and thought I'd treat myself as summer is creeping round the corner. This is definitely more pigmented than any other bronzer I've used so less is by far more. 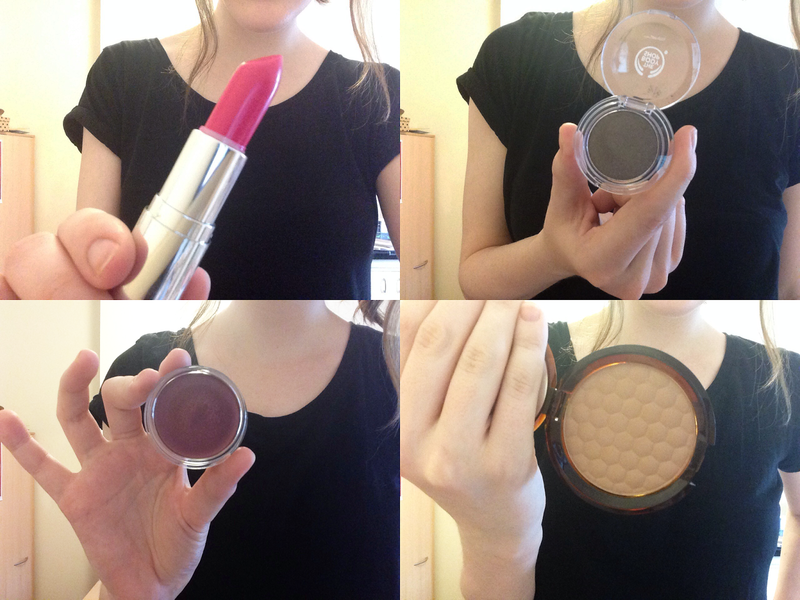 It's such a gorgeous shade though and looks totally natural on the skin when you get it right. The final beauty item I purchased was back in Boots and it was the Bourjois Paris Color Edition 24h Eyeshadow in Prune Nocturne. I'm never really one to wear a shadow that's anything other than neutral, but this colour is beautiful. It looks very purple in the pot, but when swatched it comes out a lovely creamy brown with a hint of shimmer and a lot of blending power. I can't wait to give this a proper go as it looks so, so promising. Last but not least, I couldn't leave The Body Shop without picking up a new fragrance. This time I chose the Vanilla Body Mist for days I don't fancy wearing a heavier perfume. I hope you enjoyed my little haul, I certainly enjoyed the shopping part! Let me know if you've treated yourself to anything lately.